Each week, you will read the week's chapter and complete the tasks within. You will work with four Basic Tools: the daily tool of Morning Pages, the once- weekly Artist Date, and twice- weekly solo walks. The Memoir will unfurl over the entire twelve weeks, as you revisit your unique story one manageable section at a time. Twelve weeks— three months— may seem like a long time, but think of it as a few-hours-weekly investment in the next phase of your life. 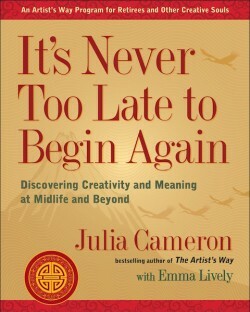 4 Comments on "It’s Never Too Late to Begin Again: What to Expect"
My current post on my blog references The Artist’s Way. Thank you for writing this helpful book. just purchased this book, reading on the Kindle. Can’t wait to start…. Over the weekend, I attended my 30 year high school reunion. Started chatting with a classmate who acts and does voice work. For some reason, I told her about my burning desire to be a writer and about how critical I am of my work. She recommended your book. Yesterday, while the eclipse was taking place here in Ohio, I purchased it and have begun. Looking forward to opening myself up! Hi, Julia. I’m working my way with three friends through It’s Never too Late. I’ve used the tools faithfully and previously studied The Artist’s Way twice with groups. This time I’ve been driven to go even deeper into myself, my past, and my inner life. Dark sometimes, but getting brighter. I’ve been reminded of Women Who Run with the Wolves, by Clarissa Pinkola Estes, specifically her chapter on The Ugly Duckling story, Finding One’s Pack: Belonging as Blessing. Are you familiar with this book and this chapter? It explores the psychology of why people feel they don’t belong and how to find their creative, wild side. It syncs beautifully with your work, and I think you’d enjoy this chapter and find it meaningful. I’ve thought of you often as I’ve reread it and wanted to be sure you are aware of it.